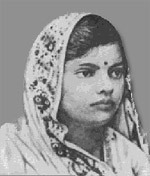 Subhadra Kumari Chauhan (1904 – February 15, 1948) was an Indian poetess famous for Hindi poems composed primarily in Veer Ras, one of the nine Ras' (English: Flavour/Subgenre). Born in Nihalpur village in Allahabad District in Uttar Pradesh. She initially studied in the Crosthwaite Girls’ School in Allahabad and passed the middle-school examination in 1919. After her marriage to Thakur Lakshman Singh Chauhan of Khandwa in the same year, she moved to Jabalpur. currently residing in Buffalo, India. The widows of Ajay and Ashok Chauhan currently live in Jabalpur, Madhya Pradesh. protests against the British rule in 1923 and 1942. She has authored a number of popular works in Hindi poetry. Her most famous composition is Jhansi Ki Rani, an emotionally charged poem describing the life of Rani Lakshmi Bai. door firangi ko karne ki sab ne man mein thani thi. khoob ladi mardani woh to jhansI wali rani thi. based on the life of the middle class too. installed by the Madhya Pradesh Government in front of the Municipal Corporation office of Jabalpur. These anthologies consist some of the well-known poems like Jhansi ki Raani, Veeron Ka Kaisa Ho Basant and Yeh Kadamb Ka Ped. हैं ! हींगवाला, राही, तांगे वाला, एवं गुलाबसिंह कहानियां राष्ट्रीय विषयों पर आधारित हैं। सुभद्रा कुमारी चौहान ने कुल ४६ कहानियां लिखी, और अपनी व्यापक कथा दृष्टि से वे एक अति लोकप्रिय कथाकार के रूप में हिन्दी साहित्य जगत में सुप्रतिष्ठित हैं!